When any of these situations happens, either your game doesn't have achievements yet or more likely you have the incorrect ROM. Just to be sure, search for the game name and check matching results. If your game has achievements but your ROM isn't in our system either you'll need to find the correct ROM or get support for your ROM. If your ROM has the same checksum/hash as those linked to the website, then it is compatible. Note: a "checksum" or "hash" is a number used to confirm if two copies of a file are identical. On RA we use it to assure the player is using the same ROM as the achievement developer. Example for Super Mario Bros. NOTE: You must be logged in to view linked hashes. You can access this page by clicking the "Hashes linked to this game" button in the "More Info" section on the game page. The first post of the official game's forum thread usually has a list of valid ROMs for the respective game and also the checksum of the ROMs. 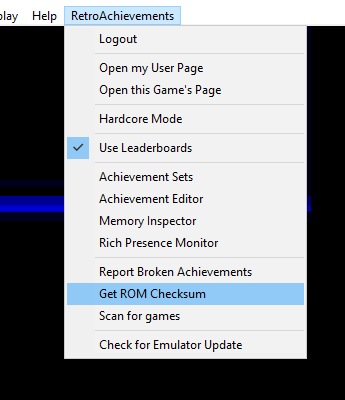 If your ROMs name and checksum aren't listed yet, then you'll need to ask for it (please, do NOT ask for links to download the ROM, only the filename and the checksum). 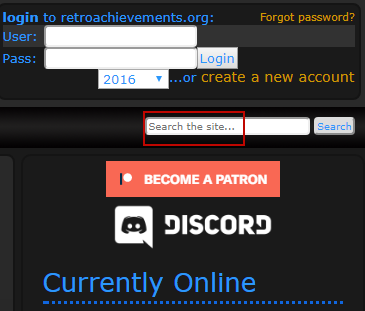 You can request it in the game's forum page or ask for help in Discord or on the site chat on the front page.